We love what we do and would love to share some of those things with you and yours. Want to learn more about local hunger? Want to meet some of our volunteers, donors, and clients? 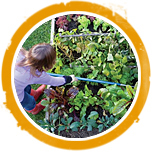 Want to learn how to compost? We’ve got answers to all of these questions…and a whole lot more. Food for Thought is our quarterly e-Newsletter. You will stay up to date on our work and get to meet some of the great folks we get to experience each day. Check out some back issues of Food for Thought and sign up to receive upcoming copies of the newsletter. Food for Thought is our quarterly e-Newsletter. In it, we share everything there is to know about our work, our people and our impact. 20% of Bellingham’s residents regularly visit our food bank. Hard to believe, but it’s true. Check out how we feed our neighbors and learn how you can join our fight. Nobody should be hungry in Bellingham.